Captain John has been Offshore fishing for 30 years. His experiences have been all along the East coast of the U.S. as well as most of the Third world countries. Best way to describe him is to understand that he wants to catch fish more than you do! No yelling or calling you $#@! @, just simple, fun and memorable moments. 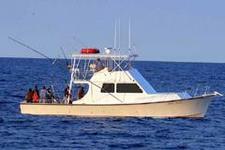 Captain John is well versed in both live and dead bait fishing either trolling or dead boating. He also brings a wealth of knowledge in the bottom fishing game. He’s a proven Tournament winner and holds a 100 Ton USCG License.